this was a day’s knitting but would have been less had i not been reworking the pattern on the fly. it began life roughly following the lil devil baby hat, but bears so little resemblance to it now i would say it’s an original design. i found the star pattern on some random web site, which luckily happened to repeat exactly with my chosen number of stitches (the same as the stocking since that matched an existing baby hat i used as a template for dimensions). 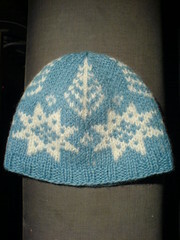 the tree motif is a traditional fair isle one, used on jumper yokes. i love the way it integrates the decreases into the pattern so cunningly and while i don’t have the skills or patience to do a whole jumper i knew i wanted to use it somewhere as soon as i saw it. i managed to mix up my k2tog/ssks yet again, just at the very top of the tree - you can see those top branches end with an upright stitch instead of the nice neat slope on the rest. i decreased more rapidly after the trees were done, as the hat was looking far too pointy. i wove in the floats as i worked as i knew i wanted to keep the designs fairly bold, rather than infilling with flourishes and the like. i didn’t totally get the hang of the weaving in - the directions i used weren’t the clearest. it worked fine when i was weaving the pattern colour but when i was weaving the background colour i ended up twisting my stitches for some reason. i knew it was likely to show on the right side, so i staggered where i wove to disguise it a little. i must have got better as i went on as it only really shows at the bottom, between the stars. i love the way it keeps my tension much more even across the longer single-colour stretches. overall my tension was more regular than the stocking, with just a few over-loose floats early on (this over-caution is probably what caused the woven threads to show so badly). i didn’t like the ear flaps on the lil devil pattern - too small - and my attempts to improvise larger flaps just made me realise how big the hat was getting overall. in the end i ripped back from the provisional cast on, past the garter rows up to the beginning of the stocking stitch and worked a few rows of ribbing to make a shorter, plainer hat. then i blocked. and it grew even bigger. at least an inch in each direction. so i figured the only way to have it fit this year was to felt it a little, which worked fine, and tamed the floats really nicely too.